My thoughtful friend Jane commented recently: ‘There aren’t many jobs left for people who do better at life when left on their own’. 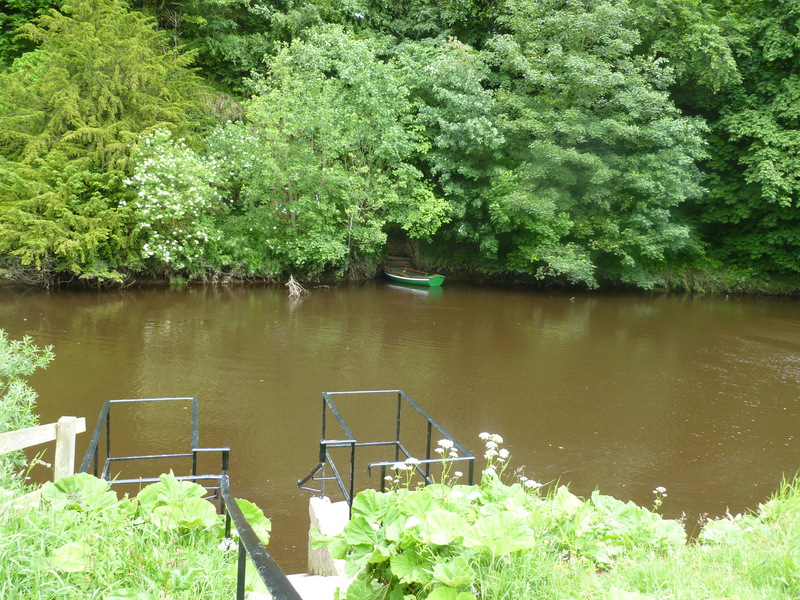 Jane and I had been talking about the men who lived at the Warkworth Hermitage. Carved into a stone rock face, the hermitage sits on a small island in the River Coquet, just upstream from Warkworth Castle in Northumberland. These days it is reached via the good offices of a friendly boatman who obligingly ferries visitors back and forth across the river. Warkworth’s hermitage is thought to have been founded in the 14th or early 15th century, probably during the time of Henry Percy (1341‒1408), the 1st Earl of Northumberland. The Percys’ forebears had been supporters of William the Conqueror and lived in Britain from the 11th century onwards, gradually accruing vast swathes of land in Lincolnshire, Yorkshire, Northumberland and elsewhere. For a time, Warkworth was their favoured base. During medieval times, wealthy patrons endowed chantry chapels, often in memory of a particular family member, and then paid a Christian priest to say prayers for the soul of the departed. Whose soul was Henry Percy concerned about? Perhaps it was that of his son, the crazy-brave Harry ‘Hotspur’ Percy, who was killed in battle in 1403 or perhaps it was a presentiment regarding his own demise five years later. After switching his support for English monarchs a number of times, the earl was killed at the Battle of Bramham Moor during one his several royal rebellions. His body was decapitated and quartered, and his head ignominiously displayed to the public on London Bridge. 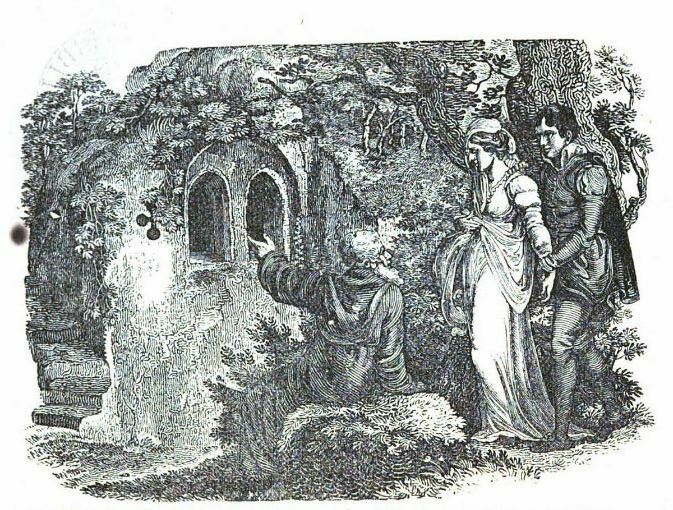 Another theory on the origins of the hermitage is offered in the ballad The Hermit of Warkworth, first published in 1771. The hermit-narrator of the long poem recounts a story to two young lovers, one of whom is the son of Harry ‘Hotspur’. The story concerns a knight named Sir Bertram: a close friend of the first earl, a gallant fighter, and a man in the throes of love. Late in the story, Bertram finds himself on a mission to rescue his true love. The mission goes badly awry when Bertram (spoiler alert!) mistakenly slays both his brother and the maiden fair. Mortified by his actions, Bertram seeks to end his life, but ‘time and thought and holy men’ send him on another path. ‘No more the slave of human pride’, he decides to spend his life ‘in penitence and prayer’. 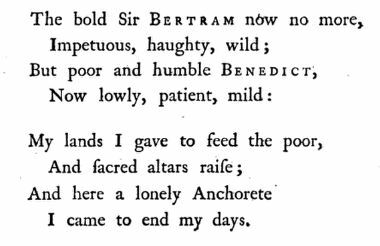 According to the ballad, Earl Percy gives his friend a refuge on the tiny island in the River Coquet and there Bertram, now named Benedict, carves out some rooms. In one of these, he sculpts the ‘beauteous form’ of his lost love. Fifty years on, Warkworth’s hermit-narrator identifies himself to his listeners as that self-same knight, now turned recluse. Figure to the left of one of Warkworth Hermitage’s window. Possibly Joseph. Did the hermitage really have its beginnings in a tale of murder and lost love? It’s unlikely, but nobody is sure. Certainly, there are figures, now worn by the weather, carved into the hermitage’s stonework. 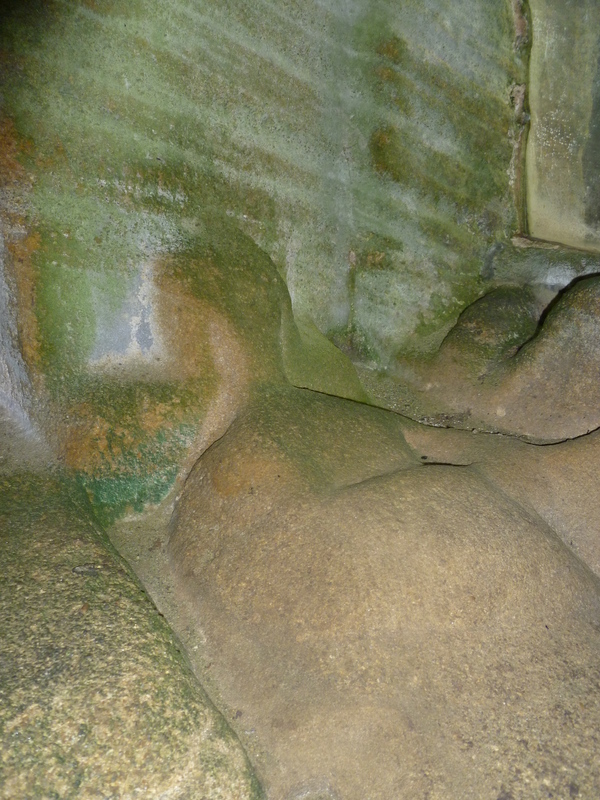 There is a tomb with an effigy that appears to depict a woman’s image with a warrior (or hermit?) kneeling at her feet. And surrounding one of the chapel’s windows, are more figures. The generally accepted view, disputed by some, is that they represent the nativity—Mary with the baby Jesus on one side of the window, Joseph on the other. Whatever the truth might be, prayer-making priests had ceased living at Warkworth Hermitage by the mid-16th century, the site’s demise probably coinciding with Henry VIII’s dissolution of the monasteries. The Hermit, or the Recluse, has long disappeared from the roadside, from the bridge end, from the river bank. His Hermitage sometimes remains, as at Warkworth, but the ancient occupant is gone. He was succeeded by the Eccentric, who flourished mightily in the last century … For reasons which the writer of social manners may discover, the Eccentric has mostly followed the Recluse; there are none left. And so, my friend Jane’s observation remains. In the 21st century, where is the place for people who prefer the peace and quiet of solitude and isolation? Percy, Thomas. The Hermit of Warkworth: A Northumberland Ballad: In Three Fits or Cantos. 2nd ed. London: Printed for T. Davies and S. Leacroft, 1771. Besant, Walter. The Fourth Generation. New York F. A. Stokes 1900. ‘Description of Warkworth Castle and Hermitage.’ English Heritage. ‘Plan of Warkworth Castle and the Hermitage.’ English Heritage. 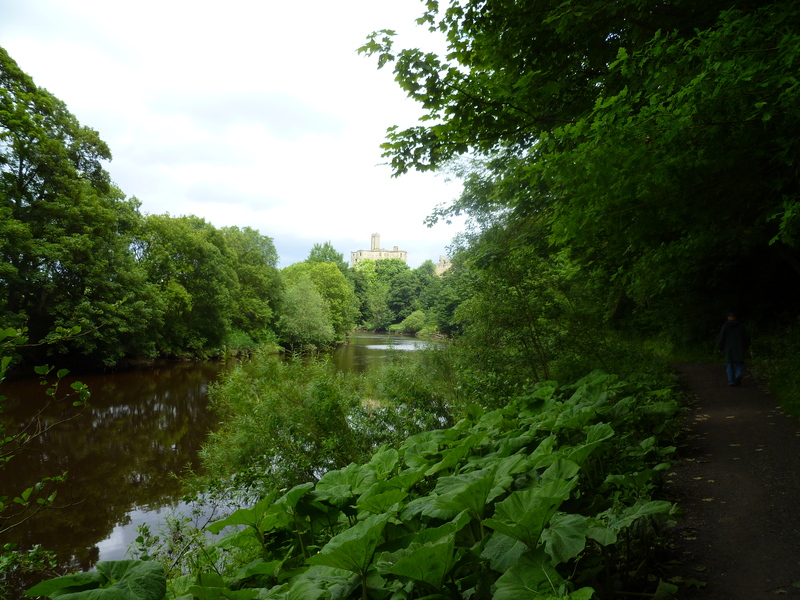 A Hand-Book to Alnwick Castle, Hulne Park and Abbey, Warkworth Hermitage & Castle. Alnwick: M. Smith, 1842. 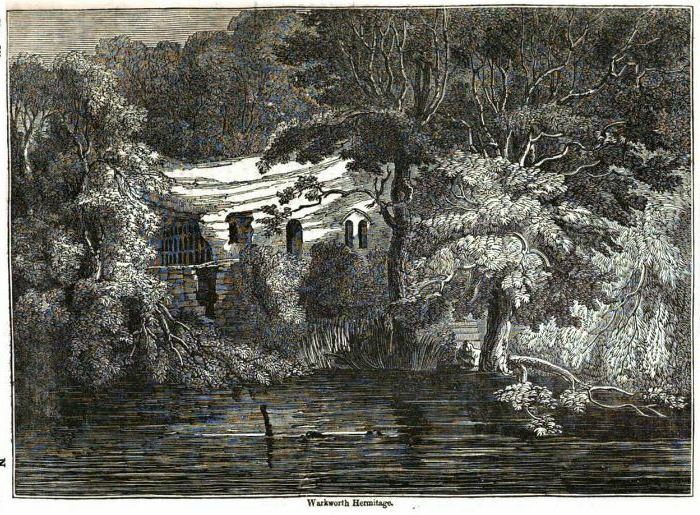 ‘Warkworth Hermitage.’ The Penny Magazine. Published by the Society for the Diffusion of Useful Knowledge, 7 March 1875. 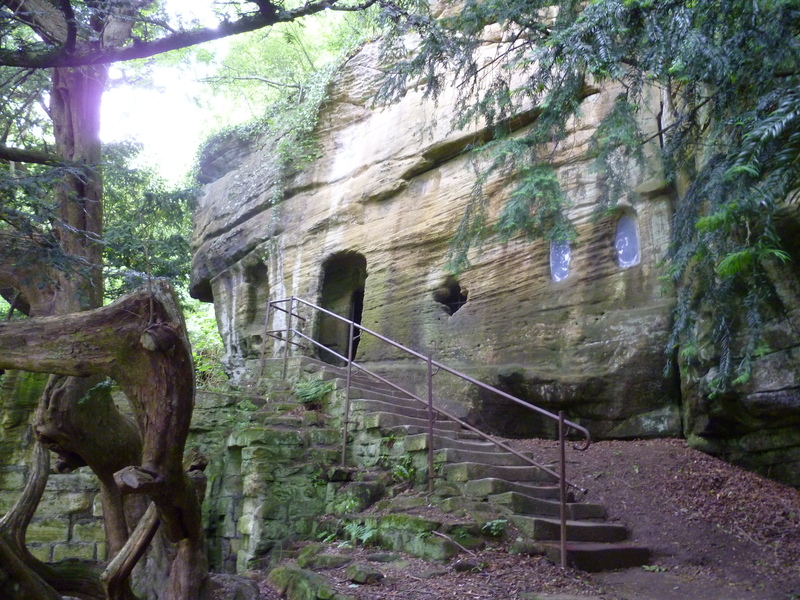 Warkworth Hermitage. Image published in the Penny Magazine. Bean, J. M. W. ‘Percy, Henry, First Earl of Northumberland (1341–1408).’ Oxford Dictionary of National Biography. Online ed. Oxford: OUP, 2004. The first earl Percy and his son Harry ‘Hotspur’ are mentioned in William Shakespeare’s Henry IV. More details via the Shakespeare and History website.